Tofuku-ji Temple ( Buddhist Temple ) is located at Kyoto's Higashiyama Ward . 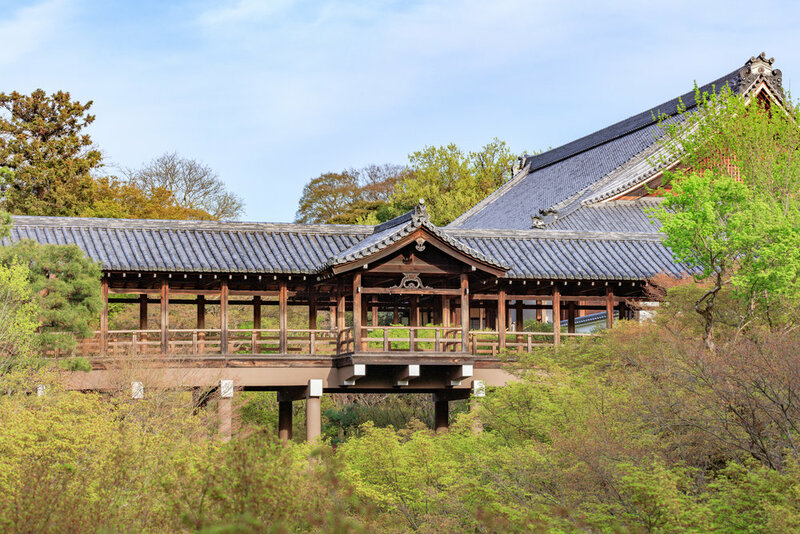 You can reach Tofuku-ji Temple either by bus ( Get off the bus at the Red Cross Hospital bus stop ) or by train ( Tofukji station on the JR Nara Line or Keihan Main Line ) . Before you reach the Kusaka Gate , that leads to the temple compounds , you will have to cross a covered bridge , the Gaunkyo Bridge . It is from the Gaunkyo bridge that you can take pictures of your beloved ones crossing the Tsutenkyo Bridge , inside the temple compounds . To cross the Tsutenkyo Bridge you will have to pay the admission fee to the Kaizando . The best timing to take this photo at the Tsutenkyo Bridge is either Spring ( Green leaves and clear sky ) or Autumn ( Autumn foliage ) . In terms of equipment , a point and shoot camera with a zoom lens with a range on the tele side of around 100 mm to 135 mm ( 35 mm sensor equivalent ) will do the job . Unless you use digital zoom on your smartphone , which will degrade image quality considerably , most smartphone cameras lenses are too wide for taking this shot . As always mind your manners as a tourist , and be considerate to others who might be wanting to take a picture like you're doing or of the view from the Tsutenkyo Bridge .